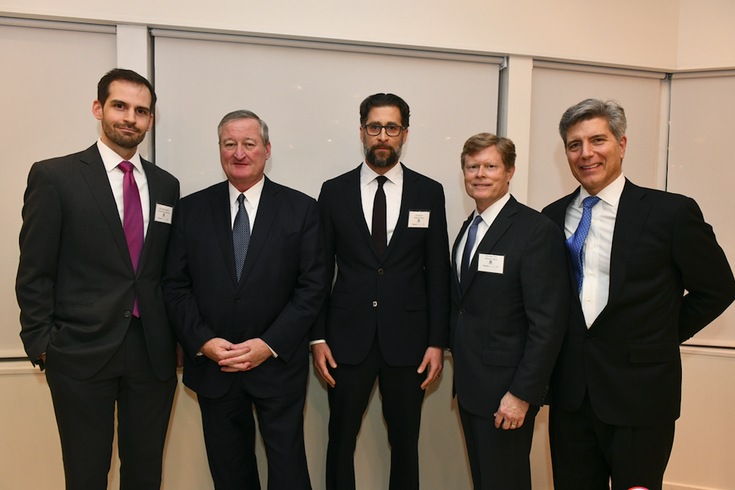 From L to R: Bob Pease, President and CFO, Franklin BioScience, Mayor Jim Kenney, Dr. Ari Greis, Mike West, Dr. Alexander Vaccaro. With February as the first month medical marijuana is sold legally in Pennsylvania through its six state-permitted grower-processors, news that Philly's Rothman Institute was getting into the game was a bonus. Last week, the Rothman Institute at Jefferson – one of the largest orthopedic practices in the United States – announced the start of a collaboration investigating the benefits of medical marijuana for patients suffering from acute and chronic pain. Rothman's partner in this enterprise is Franklin BioScience, a noted Colorado-based cannabis grower and retailer. Simultaneous to this collaboration, Franklin BioScience is planning another big move in this area with the March opening of its medical marijuana dispensary, Beyond Hello, in Bristol Township. The new partnership was announced during last Friday's "The Future is Now" VIP cocktail reception, to a room full of politicos (pot positive Mayor Jim Kenney), entertainment brand marketers (GroundUP Group's Andy Hurwitz), local musicians (The Disco Biscuits' Aaron Magner) and more. There, on the 26th floor of Rothman's Market Street offices, sipping martinis and chatting up medical cannabis never seemed better suited. Ari Greis D.O., a Rothman pain management specialist who will oversee the upcoming research with Franklin BioScience, is considered a rock star in this field. During his residence training at the University of Washington in Seattle, Greis dealt with a state that had allowances for legal medical cannabis in its pocket long before he arrived. "I treated really impaired patients in rehab clinics there with serious neurological disorders: MS, spinal cord injuries and neurodegenerative diseases," said Greis. "Many of those same patients claimed they had tried the standard medications and therapies, and that they only saw and felt significant relief by smoking marijuana." There were no medical weed dispensaries in Washington at the time Greis was in residence (2004), but a letter from their doctor allowed some patients to grow a small amount of marijuana plants. "I experienced – first-hand – people telling me that marijuana – for these patients – was the only thing that helped with muscle spasticity and neuropathic pain." Medical cannabis quickly began looking like the present of his practice, let alone its future. "As for the past, we wasted precious time with cannabis prohibition and not researching it further," he said. "Hopefully, we are remedying this." Once home in Philadelphia and practicing pain management, Greis was hopeful for – but uncertain of – medical cannabis coming to Pennsylvania. Yet, when he learned Gov. Tom Wolf was forging ahead with medicinal cannabis growing and retailing in the state, the D.O. immediately recalled his residency. "I knew then I had to get involved as I have patients in pain who tried everything and are looking for alternatives. To be in a position to have nothing to offer those in pain – beyond every alternative such as acupuncture and muscle manipulation – is a demoralizing position." When Greis heard that Jefferson had started the Lambert Center for the study of medicinal cannabis and hemp, he went straight to its director, Dr. Charlie Pollack, and got involved, as did the rest of Rothman's leaders. "We're going about this the right way; not just getting patients certified, then, never seeing them again. We're screening patients diligently for mental health disorders as well as drug and alcohol abuse," he said. Greis also touched upon the newest buzzword in addiction and its possible cure: opioids. To be in a position to have nothing to offer those in pain – beyond every alternative such as acupuncture and muscle manipulation – is a demoralizing position." According to Greis, the purpose of introducing cannabis to those struggling with opioid addiction is to see if doctors can reduce a patient's dosage and eventually wean them off of opioids. "In order to do it the right way, we have to collect outcome measures just as we would our surgical patients," he said. "We are cautiously optimistic and doing this in an unbiased way, but hopefully we can show what cannabis is good for in every way." If you're wondering how this program will work, Greis stated that the process is on the move as he spent several days last week certifying pot-appropriate patients for intractable orthopedic issues that impede their daily life. "We're giving patients ideas about what to look for when they get to a dispensary because some of them are in their 60s and never experienced or smoked cannabis in their life." This is where Franklin BioScience comes in. President and CFO Bob Pease oversaw getting its medical marijuana dispensary license in Pennsylvania because of how the state structured it as a prescription-only service. "The focus of our company is creating and distributing products that will make a difference in the lives of those suffering from medical ailments who will benefit from cannabis," said Pease. Franklin BioScience's calling card is its dedication to precision around dosing when it comes to active allowed ingredients – be it THC or CBD – that is in line with pharmaceutical standards. "Often within the industry, the regulations are more lax than that," he said. "We want our patients to be educated and aware and precise." With that, Franklin BioScience embarked on the journey to get one of the state's initial 12 grower-processing licenses as well as one of the state's 27 dispensary permits (they were awarded the latter), and then cozied up with Rothman and its new program. "One of the great benefits about working in Pennsylvania has been its wide bipartisan support. That's not true of every state. We're very fortunate," said Pease. Will cannabis one day become the norm and not the exception to healing? When you look at the advances in research of the endocannabinoid system and the extensive set of receptors in the body, Greis believes it is just a matter of time and research. "You find there are so many uses for cannabis – not just for pain," he said. "It's difficult to specify how, what, and when, as there is not just one single molecule but rather over 120 different cannabanoids that all may have some clinical significance. We're working toward finding that out."